Only Golgo 13 can free the hostages onboard the runaway trains! 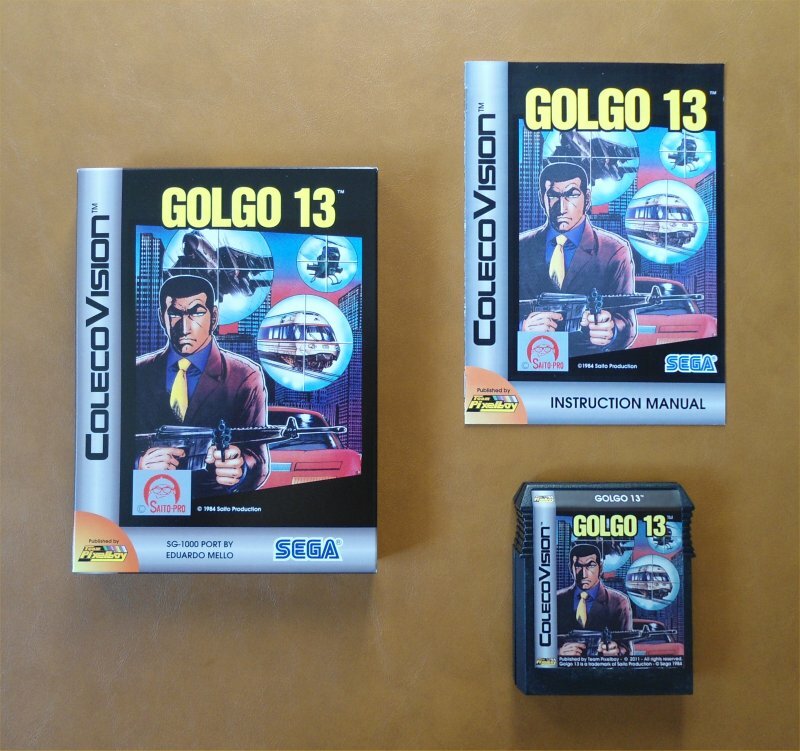 As Japan's best professional hit-man, code-named Golgo 13, you've been hired by local authorities, as a last resort, to free a group of passengers held captive onboard a number of runaway trains. In this emergency situation, there's only one way you can carry out your contract: You must drive your car alongside each train, and use your M-16 rifle to break the train's windows, in order to let the hostages escape. 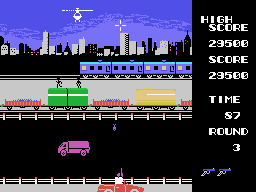 However, not only must you contend with incoming traffic of trains and cars that block your line of fire, you must also watch out for hostile helicopters bent on stopping you dead in your tracks. 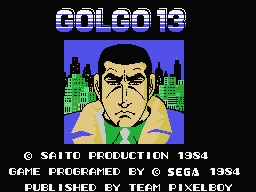 This is certainly one of Golgo 13's toughest missions! In an effort to raise money to fund his Opcode Games projects (most notably his Super Game Module), Eduardo Mello had previously been auctioning off some prototypes of SG-1000 and MSX ports on eBay. They sold rather well, but the downside is that having only five ColecoVision cartridges of each prototype meant that only five people could play and enjoy each game. In early March 2011, Eduardo contacted me and offered me his unreleased SG-1000 and MSX ports, so that they may be published by Team Pixelboy, including his SG-1000 port of Golgo 13. I gladly accepted, and now you can add this high-quality game to your collection! This game was completed and released in 2011. SPECIAL THANKS: Omar Cornut, Albert Yarusso and all AtariAge forum members. 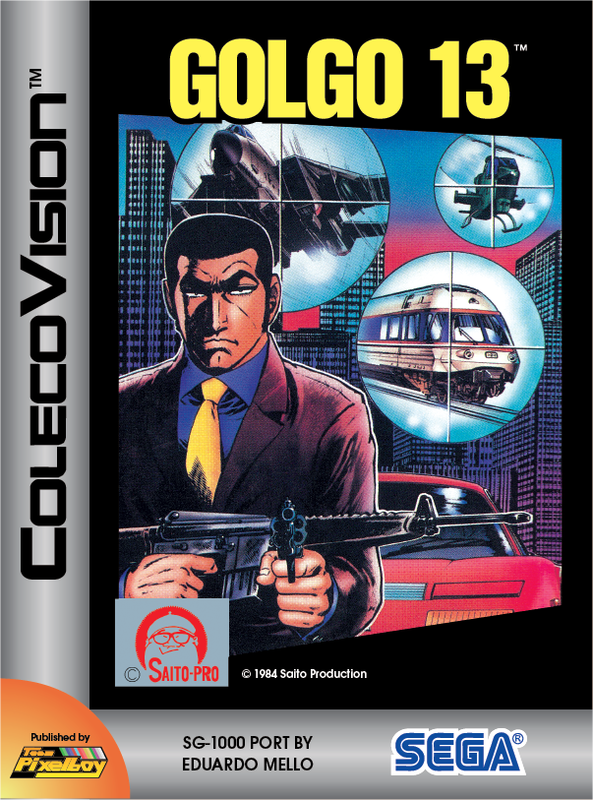 Here is a YouTube video of the ColecoVision version of Golgo 13.